Browse: Home / 2018 / July / 11 / New Research Finds Sea Level Rise Claims “Definitely Conjecture”…”Highly Erroneous”…Coastlines Stable Or Growing! Accelerating sea level rise due to global warming is supposed to eat away at the shorelines across the globe. 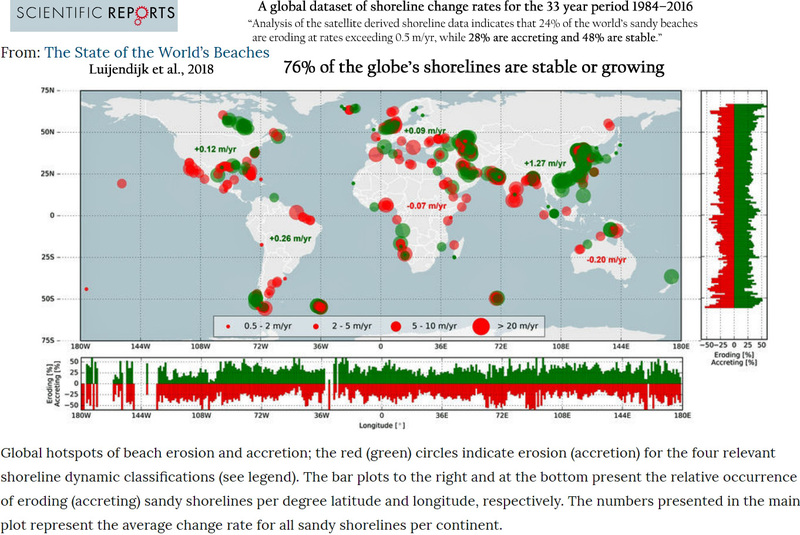 However a recent paper published in the journal Nature here authored by a team scientists led by Arjen Luijendijk found that some 75% of the world’s sandy shorelines are stable or growing! What’s surprising is that another researcher has determined that melting ice caps from global warming induced ice melt does not contribute to sea level rise, and that sea level rise is mostly caused by the Earth’s shape. He added that the prediction of 4–6.6 ft sea level rise in the next 91 years between 2009 and 2100 is “highly erroneous”! Khan then concludes that though global warming, both polar and terrestrial ice melts, and climate change might be a reality, all these phenomena are not related to sea level rise and fall. If Kahn’s assertion turns out to be correct, then IPCC scientists will have some major scientific revamping to do. Climate don’t-you-know is all about interacting cycles and chaotic fluids movements. The evidence is obvious that it is NOT and never has been about CO2 levels (that’s just politics — egos, power, greed and money). Historical records show that CO2 levels are at best a consequence of other climate factors and not the cause of them. I think “the science” probably is settled, B&T. What’s still to play for is the understanding of that science and how much you can tweak it, “misunderstand” it, or even lie about it in order to keep tenure and the grant money flowing. “The Science” of AGW is settled..
Its totally anti-real-science, and a load cobblers and erroneous quackery..
.. but that is all they have to build their cult-mantra on. Sandy beaches are fed with new sand from rivers, especially during floods. The sands migrate up or down the coast lines depending on the coastal currents. Man has altered many of the major rivers to control flooding which reduces the production and flow of sand to the coasts. Therefore, any measurement of sandy beach shoreline change may or may not be attributable to climate change. However a recent paper published in the journal Nature here authored by a team scientists led by Arjen Luijendijk found that some 75% of the world’s sandy shorelines are stable or growing! What is the connection between sea level changes and eroding/growing sandy beaches? … that is simply ridiculous and should have let all your warning bells ring very loudly. You know, BS that should trigger a skeptic mind to be … well … skeptic. My BS meter ALWAYS goes off when I read your posts, seb. You have posted NOTHING to counter any of the SCIENCE in the original posting.. Your mindless opinion does NOT count for anything. Heck, you can’t even support the central meme of the AGW scam.. ie CO2 warming. Yes I agree that the statement that man-made climate change might be a reality.. certainly IS ridiculous. There is ZERO evidence of any man-made global climate change, ANYWHERE. You are absolutely right, I didn’t counter any science in my comment. I asked a question about a connection, I notified the author that a certain paper has been discussed before on his blog and finally I pointed out that there seems to be no skepticism towards entirely unscientific claims if they somehow “feel right” (e.g. as in supporting the “it’s all a hoax” theme). Spent several line saying absolutely NOTHING of any scientific worth at all. We look at all papers as “maybe”, always sceptical. We then look at the data supporting them. They are not “unscientific ” claim made here, they are backed with solid science and rational thought process. .. you know, like CO2 warming. Again proving you have ZERO clue how science actually works. Stomach ulcers were caused by stress, y’know..
.. until ONE scientist proved they weren’t. Consensus is not science.. EVER. The history of science is littered with lone mavericks upsetting the consensus. Einstein is the most famous. He overturned the Newtonian applecart. Science is not and never been about consensus. Melting Arctic and Antarctic land ice contributes SO LITTLE to sea level rise that the AGW sea-level worriers/scammers have to introduce things like thermal expansion and modelled GIA to scare their supporters. GIA is to do with the Earth’s shape. OOPS, seb goofs up again. The Earth has ALWAYS changed shape..
.. and will continue to do so. What? Are you saying that thermal expansion is a hoax too? And now it’s Earth’s changing shape that determines the sea level in timespans at the decade/century scale … got it! Has anyone read the conclusion in the Khan paper? That one anonymous reviewer he had was not enough … this is a non-peer-reviewed junk-science paper and you guys are falling for it without the hint of just a little bit of skepticism. It’s not a hoax. But thermal expansion doesn’t deliver enough to sea level rise (about 0.64 mm/yr for 2005-2013) for the currently claimed rate to add up, especially when we consider that terrestrial water storage more than cancels out (-0.71 mm/yr for 2002-2014) the attribution from thermal expansion. Since thermal expansion and water storage on land consistently offset each other, that leaves only the contribution from ice sheets and glaciers to raise sea levels by the “problematic” amounts you’ve written that you believe in (1 meter by 2100). And, as you know, the contribution from ice sheets and glaciers isn’t going to be enough to get to that “problematic” level: the Greenland ice sheet, for example, has only contributed 1.5 cm since 1900. So where are you imagining we’ll get all this “problematic” 1-meter-by-2100 sea level rise from, SebastianH? If Greenland’s contributed 1.5 cm in 110 years, and you believe we’ll get 1,000 cm by 2100, where are these 99_ cm going to be coming from? I’m rather partial to the detailed work of Nils-Axel Mörner, myself. And let us not forget this NTZ article on what he has to say. And, for those who enjoy hearing him speak. I so enjoy hearing people speak who know what they are talking about. Correct. That’s why the belief that “global warming” will lead to meter(s) of sea level rise is so dubious. This is consistent with what Dr. Khan summarized in his paper. Yes, thermal expansion (which is completely off-set by land-based water storage) and glacier melt can contribute some cm to sea level changes, but when we’re talking meters of rise or fall (like the 120 meters of rise between 15,000 and about 8,000 years ago) — which is what the AGW activists are advocating — tectonic shifts are necessary for that kind of change. It’s rather amusing to think that people like SebastianH actually believe that we’ll get 1 meter of sea level rise (which he characterizes as “problematic”) from thermal expansion and glacier melt…especially when considering there is more land area above sea level today than there was in 1985! Yes, SebH seems to be more concerned with contradicting our sources than in being correct. Except his version of “contradicting our sources” is saying “this is a non-peer-reviewed junk-science paper”. He has nothing substantive to contradict the conclusion that meters-scale sea level changes (which is what he believes we’ll get because, you know, CO2) do not occur due to thermal expansion or glacier/ice sheet melt. Sea levels rose at rates of about 2-4 meters per century in the past. They’ve changed by a little over a tenth of a meter per century since the 1950s, well within the range of natural variability. The belief that we’ll get a meter or more of sea level rise by 2100 is rooted in presumption. His only reason for existence. And he didn’t contradict anything in the paper at all.. he just yapped mindlessly.. So modelled from PROVABLE ERRONEOUS suppositions. READ what you post seb. You might look less stupid. It’s not a hoax. But thermal expansion doesn’t deliver enough to sea level rise (about 0.64 mm/yr for 2005-2013) for the currently claimed rate to add up, especially when we consider that terrestrial water storage more than cancels out (-0.71 mm/yr for 2002-2014) the attribution from thermal expansion. Are you playing the “I found a paper that says what I want to believe” game again? Since when is land water storage negative? How does this work? You find these papers and they sound perfect for your agenda and then you argue with those “results” presenting them as facts in the hope nobody questions them (e.g. nobody being skeptic about what you claim)? So no, it doesn’t cancel out anything, because it is positive, not negative. the Greenland ice sheet, for example, has only contributed 1.5 cm since 1900. So where are you imagining we’ll get all this “problematic” 1-meter-by-2100 sea level rise from, SebastianH? Maybe you should read chapter 13.4 of the AR5 report again? So here it is, the paper you used to claim climate driven land storage would cancel out thermal expansion (or as the paper put it, glacier melt). It happens to contradict what the last IPCC report found about these changes (“In summary, climate-related changes in water and snow storage on land do not show significant long-term trends for the recent decades. “). So no skepticism towards extraordinary results like the ones in the Reager paper? That is amazing, so we will have huge water mountains at locations where the ocean is deep. This paper was so hilarious that everyone outside your bubble had a great laugh, but you seem to take it seriously, right? Another gem. Earth’s rotation is slowing down by about 2.3 milliseconds every 100 years. The reason being the Moon of course. But if you want to determine if a higher sea level would change Earth’s rotation than please take notice of the fact that rising sea level generally shifts water to the poles. Which means mass moves closer to the axis of rotation, not farther away like Mörner postulates. It is indeed amusing with what kind of “facts” you come up with to justify what you do here. But I am glad you find it funny too. So you agree with Yonason that Mörner is on to something, correct? And you think it is consistent with the Khan paper? Meter scale changes in sea level only coming from geological events, correct? So why do you claim the following then? Sea levels rose at rates of about 2-4 meters per century in the past. How does geology change so fast? And why did you use these past higher sea levels to claim that it must have been many degrees warmer back then? Why are you contradicting yourself? The belief that we’ll get a meter or more of sea level rise by 2100 is rooted in presumption. Not a belief, but a reasonable estimate of future developments. What you do is believing in something, believing that those two authors (Mörner and Khan) are correct. He has nothing substantive to contradict the conclusion that meters-scale sea level changes (which is what he believes we’ll get because, you know, CO2) do not occur due to thermal expansion or glacier/ice sheet melt. Again, read the IPCC report. Understand it. And then tell me with a straight face that a “conclusion that sea level change does not occur due to thermal expansion or glacier/ice sheet melt” has any substance. That is just ridiculous and shows a deep ignorance towards science and math. Since when is land water storage negative? Why is this new information for you? It’s a Science paper. So was Cabanes et al., 2001, which has been cited 410 times. That paper had the terrestrial water storage estimate at -0.35 mm/yr for the last 40 years of the 20th century. So peer-reviewed papers in the journal Science that have terrestrial water storage as negative are wrong? Why? Have you even read the full paper? Apparently scientists disagree about this. There’s a lot of uncertainty with these estimates. Obviously, you don’t want terrestrial water storage to lower sea level budgets, so therefore these papers must be “nonsense” and “junk” — and anyone who disagrees with you must be a “pseudoskeptic”. So no skepticism towards extraordinary results like the ones in the Reager paper? What makes these results extraordinary? The paper’s already been cited 48 times. It is indeed amusing with what kind of “facts” you come up with to justify what you do here. Since I never characterized TWS estimates as “facts”, you do not have my permission to falsely and dishonestly claim I characterized them as “facts”. Stop making up statements I never made. So you agree with Yonason that Mörner is on to something, correct? And you think it is consistent with the Khan paper? I have no idea it means to say that “Mörner is on to something”. He published a paper in 2016 (by the way, he’s authored over 500 peer-reviewed papers and is a world-renown expert on sea level rise) that said there is not enough radiative forcing or ice melt at present to reach the claimed 1 meter per century rate of sea level rise you believe in. And you think it is consistent with the Khan paper? Meter scale changes in sea level only coming from geological events, correct? How does geology change so fast? And why did you use these past higher sea levels to claim that it must have been many degrees warmer back then? Um, because the macro-level geological changes corresponded with orbital and insolation changes and actually raised temperatures by several degrees and led to glacial/interglacial-scale transitions, allowing sea levels to rise/fall by 120 meters. Really? This is new information? Not a belief, but a reasonable estimate of future developments. On what is this “reasonable estimate” based on? Past changes? There’s more land area above sea level today than there was in 1985. You purposely misquoted what I wrote. How surprising. Notice that the actual conclusion was “meters-scale sea level changes do not occur due to thermal expansion or glacier/ice sheet melt”. You left out the “meters-scale” so you could claim I wrote something I did not. How consistent of you to purposely misrepresent what I wrote. Because it is old data? Referencing the third IPCC report? I quoted you the most recent report. Interesting approach. You try to mirror my accusation back to me. That’s cute. It is you who wants a certain thing to be real so bad that you ignore everything else and point it out as a fact that land water storage would be negative. It’s very different from the current ““In summary, climate-related changes in water and snow storage on land do not show significant long-term trends for the recent decades.” view. Sorry, that guy wrote that thermal expansion wouldn’t be present in coastal regions because the water is not deep enough there. One can not take such an expert seriously. The other thing is this Earth rotation is speeding up therefore no sea level rise bit. If you don’t understand how hilarious that is, I can’t help you. 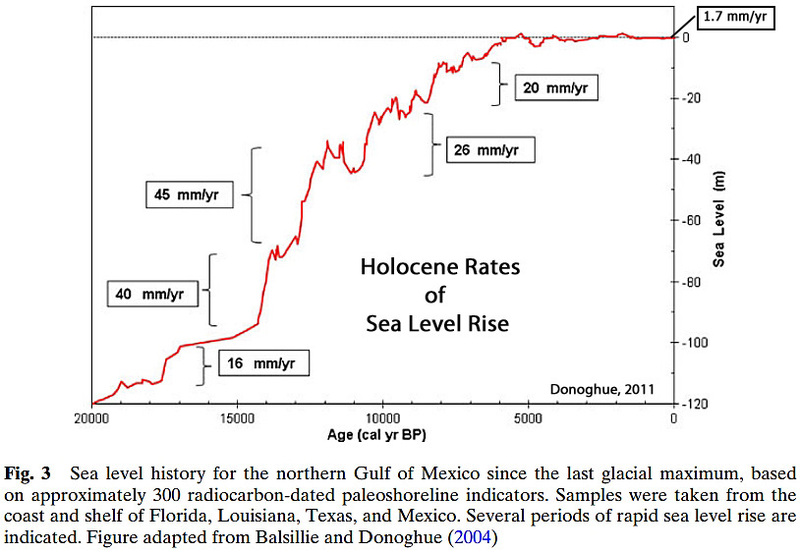 have previously elicited 1-5 meters per century of sea level rise. A rate like that is not possible today with the piddling thermal expansion + the very modest glacier/ice sheet melt contributions, no. Why don’t you just read the IPCC report? The part where they describe what contributions will lead to that kind of change. Why are you trusting some weird “scientists” who are so obviously wrong? There’s more land area above sea level today than there was in 1985. You purposely misquoted what I wrote. How surprising. Notice that the actual conclusion was “meters-scale sea level changes do not occur due to thermal expansion or glacier/ice sheet melt”. We were talking about the estimated sea level change until 2100, not multi meter changes. You think that change could not occur due to thermal expansion and glacier/ice sheet melt. Don’t you? I am sorry if you feel that I misrepresented what you wrote here. Maybe you can understand how scientists and people trying to discuss something with you feel when you leave out important parts even though i wouldn’t consider the word “meters-scale” important in this context here. I suppose you had to find something so you could again write something about misrepresentation. Again, read the actual IPCC report. Understand it. Try to be skeptical about what that Mörner guy says. And of course what’s written in that Khan paper. You are falling to easily for stuff that you find supportive … no hint of skepticism towards those findings ever. Huh? The Reager et al. (2016) Science paper was published in late 2016. The “most recent report” was 2013.
you ignore everything else and point it out as a fact that land water storage would be negative. For the second time in this comment thread, I have not referred to TWS estimates as “fact”. Quote me directly; stop using wording and making up positions that I don’t have. It’s very different from the current “In summary, climate-related changes in water and snow storage on land do not show significant long-term trends for the recent decades.” view. At what point did 2013 become more “current” than 2016? And thank you for calling the IPCC estimate a “view”. So is the Reager estimate from 2016. Neither are facts. Neither are certain. Sorry, that guy wrote that thermal expansion wouldn’t be present in coastal regions because the water is not deep enough there. One can not take such an expert seriously. Do you have the direct quote from the actual paper? Because I don’t trust your paraphrasing, as you routinely make up your own stuff and claim that that’s what someone else wrote. It’s likely that he wrote that thermal expansion wouldn’t be as much of a factor along the shallower coastal waters because deeper water expands more than shallow water when it warms (of course). In other words, unlike your likely false paraphrasing, he was speaking in relative terms: more vs. less. Not none vs. all. Your tendency is to purposely leave out key words and replace them with absolutist ones (proves, fact, never, always, 100%, none, etc.) so as to marginalize. The other thing is this Earth rotation is speeding up therefore no sea level rise bit. You’ve failed to accurately represent what he has written. Do you agree or disagree that there is a “strong linkage between Earth’s rate of rotation […] and changes in ocean circulation” (what he actually wrote)? Why are you trusting some weird “scientists” who are so obviously wrong? So neither Dr. Kahn or Dr. Morner are real scientists now? They’re just…”weird”? In what way are you a scientist, SebastianH? I see, now you think geological changes are causing everything, even temperature change. That’s not what I wrote. I would ask you to correctly quote what I have actually written rather than making up phrasing and wording (I would never write “causing everything”) and then claiming that that’s what I think. I wrote “macro-level geological changes corresponded with orbital and insolation changes and actually raised temperatures by several degrees and led to glacial/interglacial-scale transitions”. See how different that is than your “now you think geological changes are causing everything” misrepresentation. Because humans build islands and lakes lost water? No, because geologic changes are more determinative of changes in relative sea level than climate factors. You think that change could not occur due to thermal expansion and glacier/ice sheet melt. Don’t you? No, for the 3rd time in this comment thread, that’s not what I’ve written. (And you know that, but purposely misrepresented what I wrote anyway.) For meters-scale (I didn’t use “multi-meter”) changes to occur, we will need far more warming than what is available currently with climate-related factors. Thermal expansion contributed about about 0.6 to 0.7 mm/yr during the last 50-60 years. Glacier/ice sheet melt contributed about 0.6 to 0.7 mm/yr during the last 50-60 years. The “sum of the contributors” to sea level rise for 1958-2014 amounted to a paltry 1.3 mm/yr (and this doesn’t include terrestrial water storage estimates). That’s not enough to get to the 1 meter of rise by 2100 that you believe we’ll get. For meters-scale changes to occur, we’d need ice sheet collapse and for kilometers-thick ice sheets to be blanketing much of the Northern Hemisphere (as was the case 15,000 years ago) to yield this kind of change. The poles average -30 C year-round. East Antarctica — where the vast majority of the Earth’s land water exists — has been cooling and gaining mass for decades. Greenland contributed 1.5 cm of sea level rise equivalent meltwater in the 110 years between 1900 and 2010. Again, 1.5 cm/century contribution is not enough for meters-scale sea level rise. I am sorry if you feel that I misrepresented what you wrote here. You purposely misquoted me by putting quotes around wording that I never used, excluding the wording (“meters-scale”) that I actually did use. Would it be so difficult to actually quote what I truly did write? i wouldn’t consider the word “meters-scale” important in this context here. Why would clarifying the relative amount not be important? By excluding it, you are purposely making it appear as if I have written that thermal expansion and glacier/ice sheet melt don’t contribute to sea level rise. They do. Just not enough to reach the “problematic” levels of sea level rise you believe in. I suppose you had to find something so you could again write something about misrepresentation. I don’t enjoy pointing out that you have misrepresented what I wrote. Why not avoid this by taking the few seconds to copy/paste my exact wording, including all the key words? It would be more honest. Seb, STOP PRETENDING that you have a sceptical bone in your body. You just have a mindless reaction against ANYTHING that counters you AGW brain-hosing. … and mindlessly try to use anti-science bluster and yabbering to counter anything that is counter the scam. That is NOT scepticism.. that is ZEALOTRY. But you are too self-absorbed in pumping up your own baseless self-importance to see it. We are skeptical of your belief that we can get to 1 meter of sea level rise by 2100 via thermal expansion (which is offset/canceled out completely by terrestrial water storage) and glacier/ice sheet melt (Antarctica, Greenland, mountain ice), which has only contributed a few centimeters in the last 50-some years of “hottest on record” temperatures. So where is your skepticism that we can get to 1 meter of sea level rise with the current contributors? It’s interesting that when a renown university geophysicist concludes something you disagree with, suddenly it becomes a “junk science” journal that is not peer-reviewed. This is from the same person who regularly cites blogs or The Guardian as references. In case you’re interested, here is a more in-depth look at the Khan paper from back in March, including supporting evidence from several other papers that are peer-reviewed and published in peer-reviewed journals. I doubt you’re interested, though, SebastianH. As a believer, you prefer to glance and then start in on the accusations. We are skeptical of your belief that we can get to 1 meter of sea level rise by 2100 via thermal expansion (which is offset/canceled out completely by terrestrial water storage) and glacier/ice sheet melt (Antarctica, Greenland, mountain ice), which has only contributed a few centimeters in the last 50-some years of “hottest on record” temperatures. 1) “(which is offset/canceled out completely by terrestrial water storage)” … just no. Where is your skepticism towards papers like the one you cited for this claim? 2) It’s not my belief. It’s what thousands of scientists estimate will happen: https://imgur.com/a/9jqs9mq (second image for the how). So where is your skepticism that we can get to 1 meter of sea level rise with the current contributors? There are sufficient sources/papers that go into that direction. I don’t just follow a paper/author blindly when the “results” are what I like to hear … like you do. Papers that go against the rest and sound physically impossible always make me skeptic about them. 1) this guy is citing Wikipedia in this “paper”. 2) he claims that “melt-water would not move from polar region to equatorial region.” and yet he also claims that melting ice from Antarctica “can cool ocean-water in the region of equatorial bulge thus can prevent thermal expansion of the ocean water” . Not suspicious yet? Then how about this great scientific breakthrough? 3) “Further, melt-water of the floating ice-sheets will reoccupy same volume of the displaced water by floating ice-sheets causing no sea-level rise.” … I bet this finding surprised him a lot and thus it deserves mentioning. So the ice melts and the land below rises because less weight keeps it down. So he claims that this would mean that the relative sea level of that location would drop and presumably cancel out the rise from the melting ice, correct? Does this work just like in point 3 above? Well, what about the rest of the planet? Doesn’t the rebounding crust also displace water in that region increasing the sea level everywhere else? What do you think? See, it is full of contradictions and sentences like “Author gratefully acknowledges the critical and constructive comments of one anonymous reviewer” don’t inspire a lot of confidence in this work or that someone who has clue had anything to do with it. That rings my skeptic alarm bells, but apparently not yours. You just believe it because it supports that “we are being lied to” theme. No, as a sane person with some level of understanding of physics and math, I am able to detect BS. That’s called being skeptic. What you do is called confirming your bias any way possible … even if you have to support Mörner or Khan like papers/authors. hilarious, to say the least. You are FABRICATING CRAP yet again !! Thermal expansion due to natural solar warming has a large effect. To me that sounds like you are saying that AGW proponents “invented” thermal expansion due to global warming (rising OHC) because ice melt would not be a big enough contributor alone. This is confusing. What kind of thermal expansion did you mean then in the part I cited? Yes, we know you are VERY confused. And YET AGAIN avoiding any science to back up any warming by CO2, basically admitting that the tiny OHC rise is purely down to solar effects. basically admitting that the tiny OHC rise is purely down to solar effects. Serious question, do you think climate science says that CO2 is warming the ocean? Is that your level of understanding? Of course it is the Sun. I think you are a little bit lost here. Yes we KNOW only SOLAR energy warms the ocean. Nothing to do with human anything. FINALLY can we get away from the idiotic conjecture that human CO2 has any effect whatsoever on OHC. You are totally lost without that conjecture, though, aren’t you seb. With a hollow earth model, the outer seas are joined to the inner sea by the ‘great fountains of the deep’. As spacetime within the shell is near flat, and ice melt results in the inner sea growing. Observed sea level is matched to terrain mass, and is a solution to the least energy state for a shell held together by lateral gravitational attraction. The biblical floods occurred because the connecting passages froze over. Derg is just trying to cheat you. How DARE he?! spikes checks in his wallet and bank account..
.. and ups the bid to $16.75 AU. At times, they work on scaffolds at great heights. Suppose a significant proportion of the Pacific basin had gradually bulging by say 20cm over the last 100 years, would we even know? Yet it might be enough to account for ALL of the current tiny sea level rise that may have occurred. We totally missed the formations of those islands that just “appeared”. Only just discovering large volcanic regions under Antarctica. We know tectonic plates are constantly shifting. There is merit in the suggestion of, what sea level rise there is, being mostly NOT from Arctic and Antarctic non-melt.